Kaie, a Breton nightblade, is a member of the Forsworn who meets with Madanach and the Cidhna Mine escapees and gives them their equipment just before leaving the Markarth Ruins. She will follow Madanach, fight alongside the Forsworn, and run all the way to Druadach Redoubt where she will settle down. Kaie is fully clad in Forsworn equipment. This includes Forsworn armor, a pair of Forsworn boots, a 50% chance of a pair of Forsworn gauntlets, and a 50% chance of a Forsworn headdress. She is equipped with either a Forsworn sword or a Forsworn axe, and carries two potions of healing. She knows the Alteration spell Oakflesh, the Conjuration spell Raise Zombie, and the Destruction spell Flames. When she meets you at the gate to Markarth, she will have a brief conversation with Madanach, saying: "Madanach. I've brought what you asked for." to which Madanach will respond: "Good work. Get ready while I have a word with our favorite outsider." 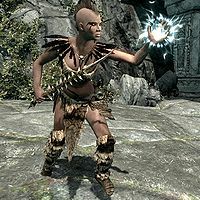 Madanach then turns to you: "I had Kaie recover all the things the Nords stole from you. You better get ready before we break out into the city. And take this. It's blessed with the old magicks. Something to remember me by." When Kaie hands the escapees their equipment, she may say: "It wasn't easy getting all your things. A few guards had to have their throats slit." During the escape, she will shout, "For the Forsworn!" This page was last modified on 24 December 2017, at 22:13.